As we arrived at Suvarnabhumi Airport, Bangkok, Thailand I didn’t feel like I was in a developing country anymore. Everything seemed very advanced in comparison to Cambodia and even Vietnam. Technology was more advanced, there were more English speakers, a lot more foreigners living in the city and even the marketing was different. Day 6: Cambodia, it has Been an Honor. Day 3: Goodbye Vietnam, Hello Cambodia! Day 2: We saw how your Nike shoe was made! Day 1: It all started at 8:45 AM January 4th, at our hotel lobby in Vietnam! 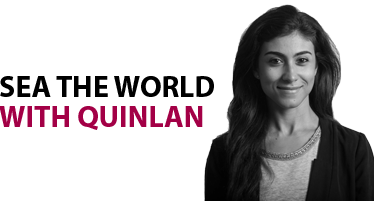 Eman is an MBA student at the Quinlan School of Business, Loyola University Chicago. Eman moved from Egypt to start her MBA program after two years of work experience in marketing and advertising. Eman was also part of the marketing study abroad course offered in the program - MARK 561 'Comparative Consumer Behavior and Marketing in Emerging Southeast Asia' taught by Professor Cliff Shultz. The course is split in two parts. One that takes place in Chicago and the other part is a 10 day journey that immerses students into the streets and culture of selected countries in South East Asia; Vietnam, Cambodia and Thailand. Eman was part of the media team on this trip and wrote a daily blog to document the experience.